Day 2 of Shanghai Masters after the wildcard round yesterday though zero out of eight players advanced to Last 32. But today's morning actions were fascinating. The unfortunate loser Dale had chances to win the match early on. The former tounrmanet winner back in 2007 said: "At 4-1 up the match was mine. I had all the chances I could have wished for. Usually I am good under pressure but not this time. Maybe winning meant too much to me." 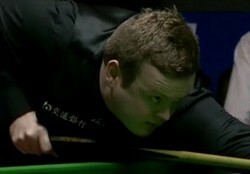 Murphy sets up an exciting clash with Mark Allen, who had a speedy victory 5-2 over Ryan Day in the next round. The Defending Champion was sent home in the first round. Mark King dramatically won 5-4 from 3-4 down. Carter was about to win the match 5-3 in frame 8 that King won on the respotted black. This huge frame turned everything upside down. Carter said simply: "I was terrible. I expected to win so I'm very disappointed." The Rocket Ronnie O'Sullivan captured 5-1 victory over James Wattana. Ronnie withdrew from the event last year due to personal reasons did not disappoint the fans this time. With the help of two centuries 110 and 111, along with 97, 76, 53, Ronnie booked his seat in the next round. However Ronnie missed a number of easy balls today, he needs to raise his form before his match with Hamiliton. Anthony Hamilton continued his brilliant form today to win 5-4 over Stephen Maguire. Hamiliton played terrific snooker these two days. He made 123, 75, 60 and 52 yesterday during the 5-0 victory against Li Hang. Today Hamilton even made 3 centuries in a single match: 129, 112, 104. Brilliant performance. Jamie Cope edged out Jack Lisowski 5-3 though Lisowski was trying to trail from 1-3 down. Tough win for Mark Selby 5-3 over Nigel Bond. Selby did not perform well but a win is win.